An automatic module is a named module that is defined implicitly, since it does not have a module declaration. An ordinary named module, by contrast, is defined explicitly, with a module declaration; we will henceforth refer to those as explicit modules. There is no practical way to tell, in advance, which other modules an automatic module might depend upon. After a module graph is resolved, therefore, an automatic module is made to read every other named module, whether automatic or explicit. Here guava is dependency that consider as automatic module. 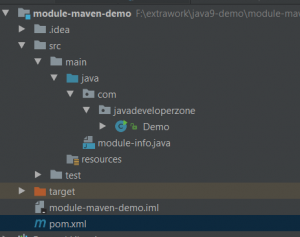 Need to add require statement in module-info.java as bellow. Note: Modules name do not allowed – or . character as module name so maven will manage it. At time of require statement no need to specified dependency version. * Created by JavaDeveloperZone on 22-04-2017.